Yarmouth next year. 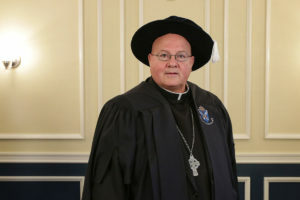 Pope Francis has appointed Dunn the Coadjutor Archbishop of Halifax-Yarmouth, and will work with Mancini until he resigns from his post as Archbishop in November, 2020 on his 75th birthday. Once Pope Francis accepts Mancini’s resignation, Dunn will assume the post as Archbishop. A release from the Antigonish Diocese says the appointment of Dunn as a co-worker with Mancini is a proactive step to ensure a smooth and pastorally sound transition of leadership. Dunn has also been appointed Apostolic Administrator for the Diocese of Antigonish until a new bishop is assigned. Dunn will continue to reside in Antigonish for the near future while serving in both Antigonish and Halifax-Yarmouth.